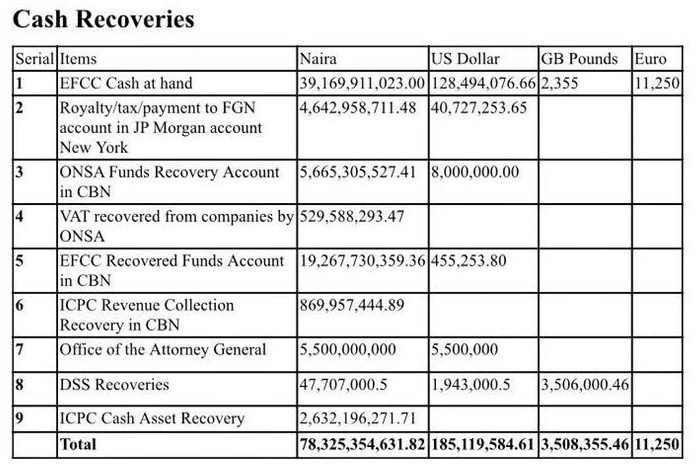 Segun Adeyemi(Abuja): The Federal Government through the EFCC anti-corruption crusade has made cash recoveries totaling N78,325,354,631.82 (Seventy eight billion, three hundred and twenty-five million, three hundred and fifty-four thousand, six hundred and thirty one Naira and eighty two kobo); $185,119,584.61 (One hundred and eight five million, one hundred and nineteen thousand, five hundred and eighty four US dollars, sixty one cents); £3,508,355.46 Pounds Sterling (Three million, five hundred and eight thousand, three hundred and fifty-five Pounds and 46 Pence) and 11, 250 Euros (Eleven thousand, two hundred and fifty Euros) from 29 May 2015 to 25 May 2016. 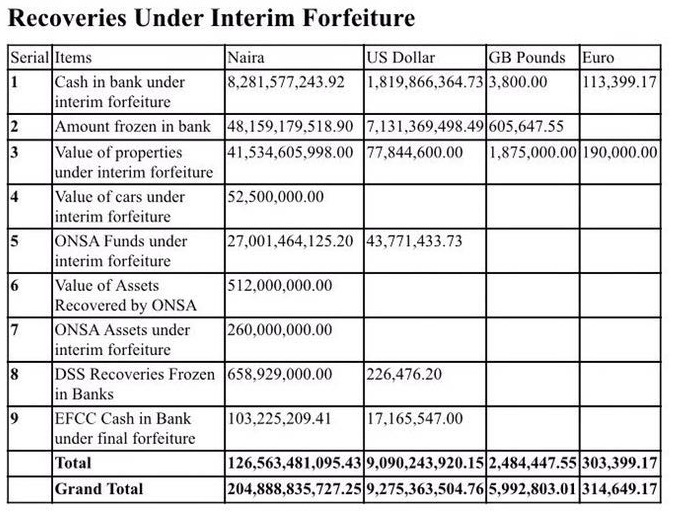 In a statement in Lagos on Saturday, the Minister of Information and Culture, Alhaji Lai Mohammed, also disclosed that Recoveries Under Interim Forfeiture (cash and assets) during the period totaled N126,563,481,095.43 (One hundred and twenty six billion, five hundred and sixty three million, four hundred and eighty one thousand, and ninety five Naira, forty three Kobo; $9,090,243,920.15 (Nine billion, ninety million, two hundred and forty three thousand, nine hundred and twenty Dollars, fifteen cents; £2,484,447.55 Pounds Sterling (Two million, four hundred and eighty four thousand, four hundred and forty seven Pounds, fifty five Pence) and 303,399.17 Euros (Three hundred and three thousand, three hundred and ninety-nine Euros, 17 cents ). 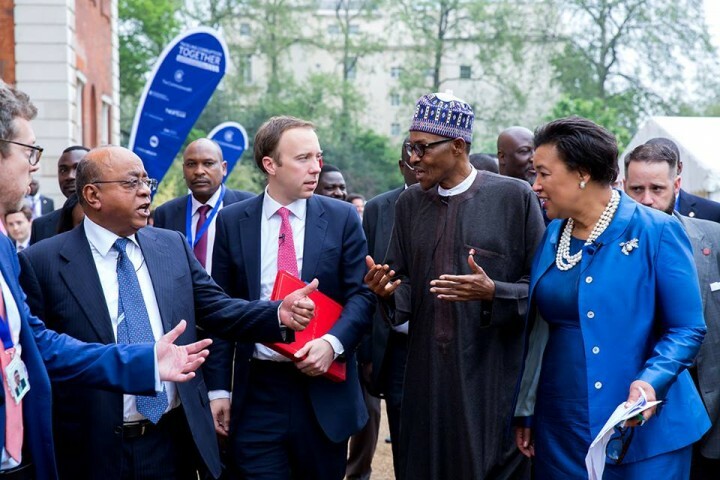 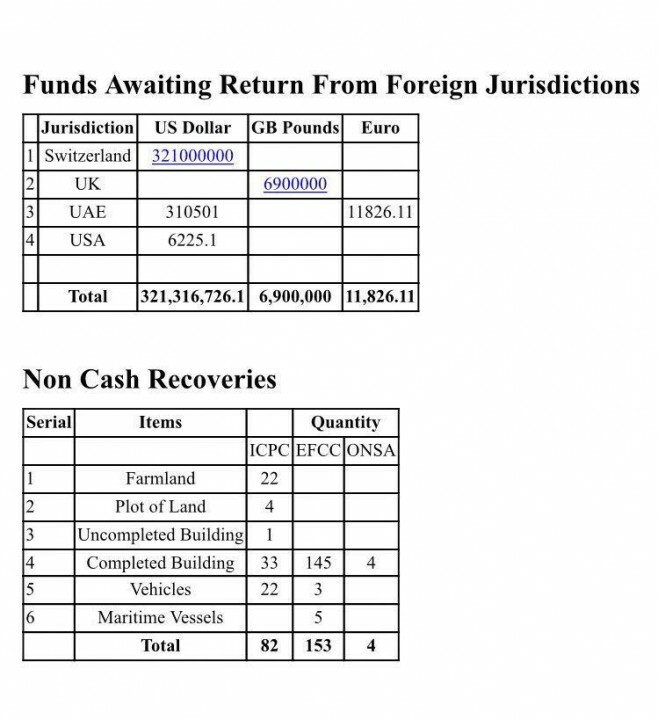 According to the statement, which is based on the interim report on the financial and assets recoveries made by the various government agencies from 29 May 2015 to 25 May 2016, the Funds Awaiting Return From Foreign Jurisdictions total $321,316,726.1 (Three hundred and twenty one million, three hundred and sixteen thousand, seven hundred and twenty six Dollars, one cent); £6,900,000 Pounds (Six million, nine hundred thousand Pounds) and 11,826.11 Euros (Eleven thousand, eight hundred and twenty six Euros, 11 cents).